Alumicolor's® Cut and Measure Set makes cutting and measuring easy and safe! 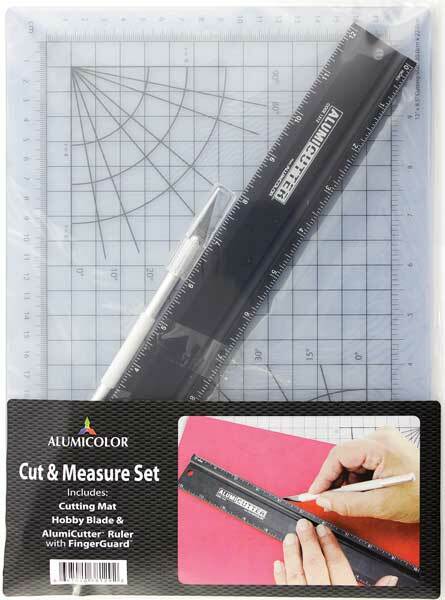 Alumicolor's® Cut and Measure Set includes the popular AlumiCutter™, a multi-purpose self-healing cutting mat and the Excel #1 light-duty hobby knife. Ideal for applications that require both measuring and cutting. Plus, we keep your safety in mind with the AlumiCutter's raised edge and finger groove that protects your fingers. 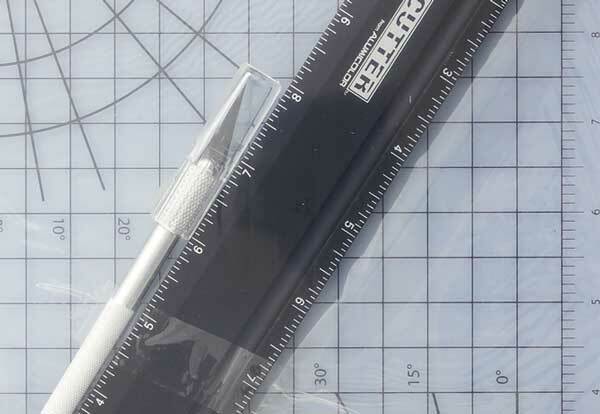 The AlumiCutter™ - Measure and cut with one tool! Made from extruded aluminum with photo anodized calibrations and recessed non-slip backing. Raised cutting edge and finger groove protect fingers while cutting. One of the finest tools around. Multi-Purpose Cutting Mat - Provides an excellent surface for cutting. Made of a 3-ply bonded composite material with a non-stick, non-marring, no-glare surface. "Heals" itself when cut. Aluminum Hobby Knife - The Excel #1 light-duty knife features a 4-jaw machined chuck to secure the blade and an aluminum handle with knurled surface for a secure grip. Packaging: Poly-sleeve with hang tag.